Growing up I was lucky to have a huge family garden in our backyard. With most of the fall-themed recipes that I have been making lately, mostly supplied by the local farmers market, I remember how my family used to just go out to the garden and pick vegetables for dinner. Every fall there was a week or two that was tomato-canning time. My mom would make huge batches of tomato soup and sauce with the tomatoes from our garden. I am talking about 30-40 jars here. Now I live far away and don’t even have a yard, so I decided to try making my own, albeit single batch serving, of tomato soup. When a recipe is as simple as this one, quality ingredients really shine. I suggest searching your local farmer’s market, roadside farm, CSA box, or better yet if you have your own garden, for some ripe tomatoes and onions. This is the perfect time to use these ingredients as the weather transitions into fall. I love the added flavor that roasting the ingredients brings out. It also smells amazing and had my stomach growling well before it was done. But maybe that’s just me and the smell of roasted garlic. Before and after. You can also add more garlic to the recipe if you are like me and can’t get enough. Before roasting, I also stripped some of the really seedy parts out of the tomato slices, mainly because I didn’t want the seeds in my soup. If you haven’t invested in a hand blender, I cannot stress enough how wonderful they are! They especially come in handy for making soup, but I also use my often for smoothies. You can blend the ingredients right in the pot. That way there is no need for the precarious transferring of steaming ingredients to a blender and back again. I had to include a photo because I love them just that much. 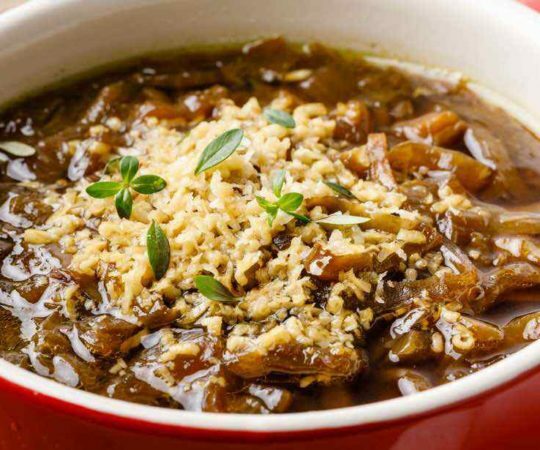 This recipe makes a beautiful seasonal soup, which can serve as an elegant first course or the main entrée for dinner. Not only that, but tomatoes are loaded with vitamin C, which is always good to have in large quantities when the colder weather comes around. Though I haven’t made it to the canning stages yet, this will definitely be a repeat recipe for the fall. Sometimes the simple things in life are the most satisfying. 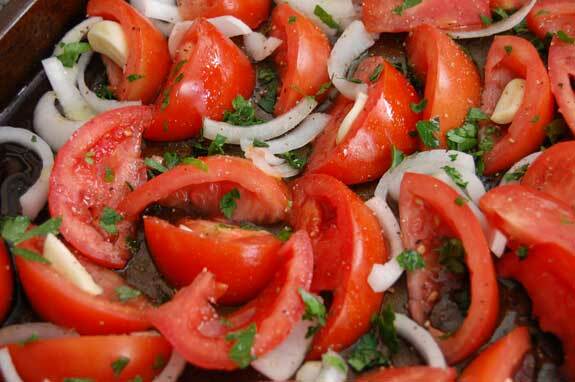 Cut the tomatoes and onion into wedges, then spread on a rimmed baking sheet. Drizzle with the olive oil, salt, pepper, and chopped parsley. Gently toss together with your hands. Tuck the garlic cloves into a tomato so that they don't burn. 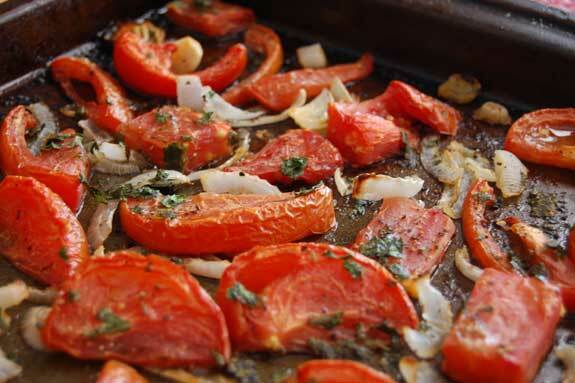 Roast for approximately 40 minutes until the tomatoes are reduced to about half their size. Remove and let cool. Warm the vegetable stock in a large pot on medium heat, and stir in tomato paste. Add the ingredients from the roasting pan into the broth and simmer for 8-10 minutes. 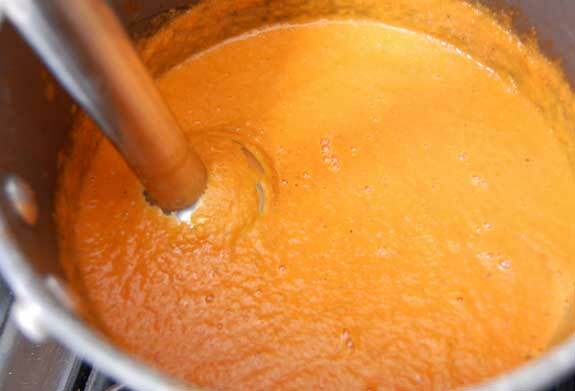 Use an immersion blender to puree the soup in the pot, or transfer to blender or food processor and blend until soup is smooth. Add any more salt and pepper to taste. Best tomato soup recipe I’ve made! That soup turned out so well! I made it with tomatoes from the garden and added a chipotle pepper for some heat. Definitely a keeper! This looks great and I’m going to make some this weekend. 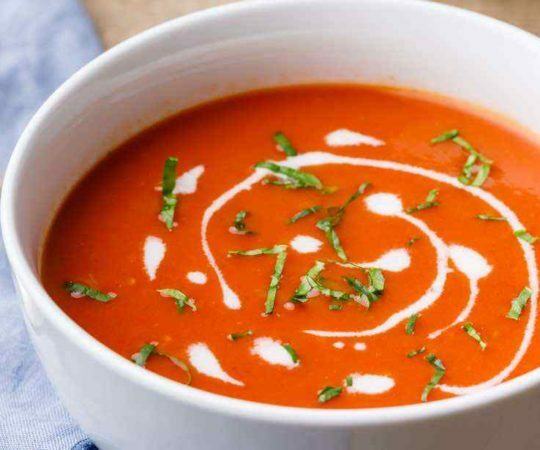 Does anyone have recommendations on a good tomato soup which is available in grocery stores? Every soup that I have found so far contains dairy and/or wheat products, even the ‘healthy’ brands. I’m new to this diet, but I’m trying to completely cut out added sugars, dairy and wheat products. Thanks, Rob. 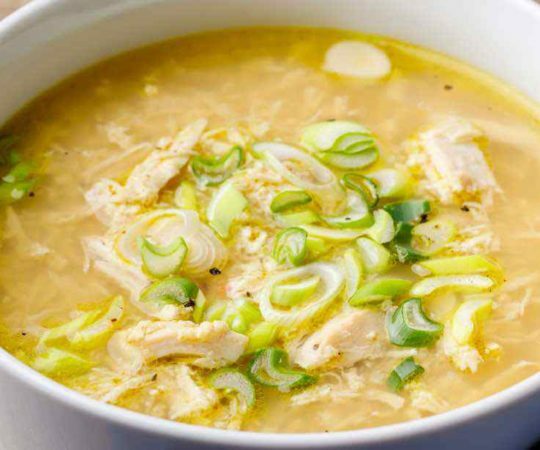 It would be nearly impossible to find a truly “paleo” pre-packaged soup as eating paleo means aiming to eat fresh, homemade foods. The other issue I have found is EVERY tomato soup has high fructose corn syrup. My advice would be to make a double batch of this soup and store single- servings in small jars in the freezer. Or some people make “soup cubes” with ice cube trays. 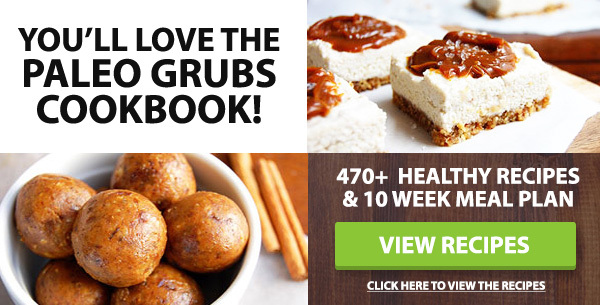 That way you can have a quick meal for when you’re short on time, but still follow the paleo guidelines. I would have failed miserably at my whole30 without freezing soups for when I was in a rush or feeling lazy! I hear you, Robert. Any kind of soup has waaaay too much sodium. Your best bet is to embrace soup making including stocks and broth. This soup is fantastic!! I added a tsp of basil and a tsp of oregano just as a taste preference. I also thickened it up with a tablespoon of coconut flour so that I could make it creamier with coconut milk and not make it too soupy. 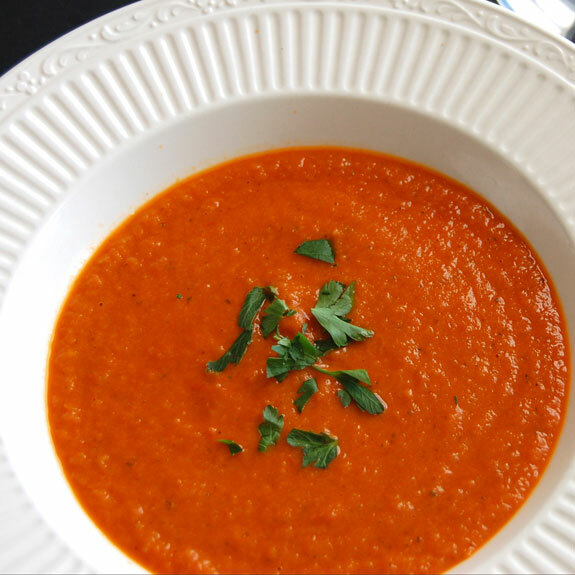 Best tomato soup recipe, paleo or otherwise, that I have found! Thank you! Just making this now, how much soup does this make? For 4 people as a starter? Hi Claudia, it made 2 dinner sized bowls for us. 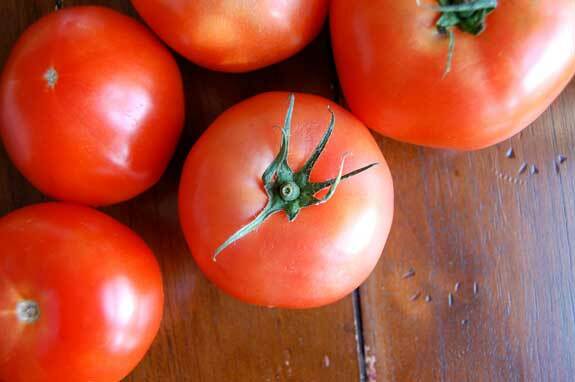 How many roma tomatoes would equate to 4 large tomatoes? Looking to use a less seedy tomatoe. Thank you! Great recipe but i found it too acidic (i would normally add sugar to balance that acidity) what could i use instead? Claudia, the recipe made 2 small servings. 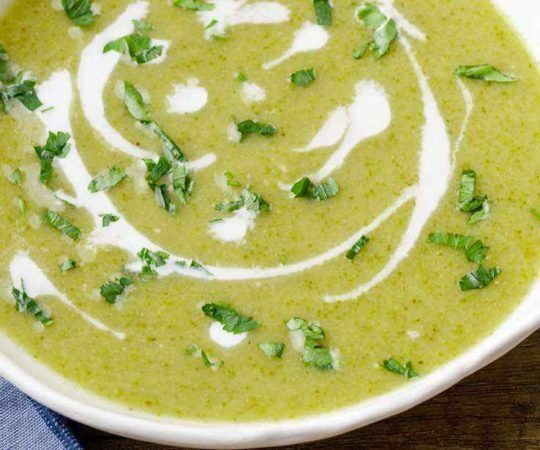 I added 1/2 of an avocado and blended it into the soup and that did a great job to offset the acidity. It also gave the soup a nice creaminess. Ahhh love this recipe! First time making soup! Hah! Now I feel like I can take on any soup! Thank you! Any ideas of what this would be like chilled? The soup chilled is nice (especially if you decide to get creative and add a little shrimp or seafood to it! 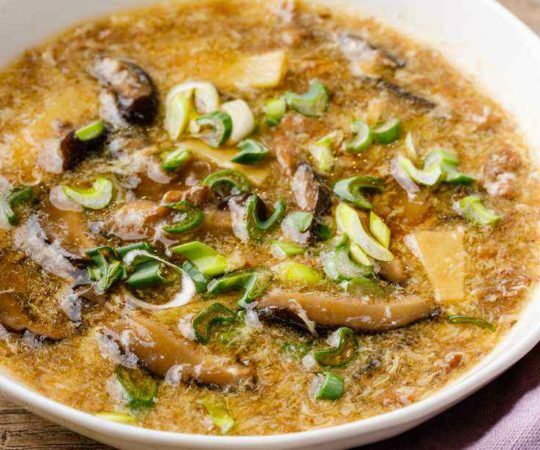 ), but I’d recommend thinning it out a bit by adding some extra broth when you serve it cold because it is somewhat hearty and thick (and thus it lends itself better to a hot soup). 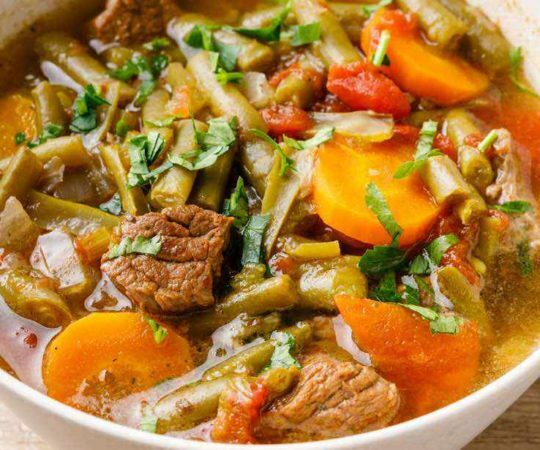 My fiancé and I are preparing this dish right now the aroma’s are filling the house with Paleo goodness.No doubt this will be a staple in our home!!! I used to like tomato soup, now I love, love, love it! I didn’t realize what I have been missing the past 70 years. Thank you so very much for sharing .